Arsenal’s decision to bring a halt to contract talks with Aaron Ramsey surprised everyone. Now, with his contract expiring at the end of the season, Liverpool seem to be circling. Our friends at Football Whispers have taken a look at where he might fit in on Merseyside. 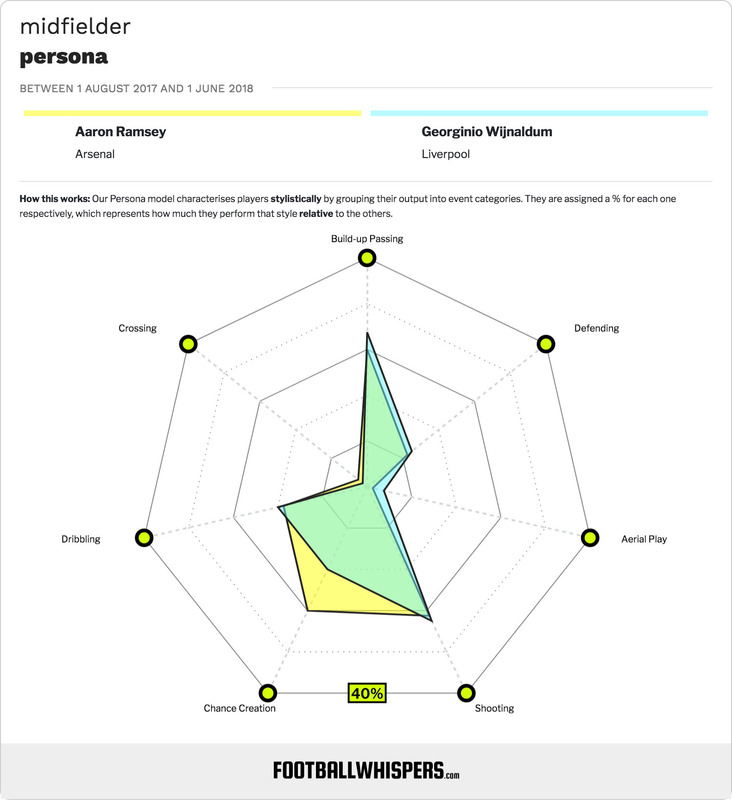 Every change of regime brings about casualties, and it seems that Ramsey is set to become one of the Unai Emery’s. The rumours are that the Welshman is set to ‘do an Ox’ and move from Arsenal to Liverpool, and he’d be likely to play in a similar position to his former (and possible future) team-mate. When Alex Oxlade-Chamberlain arrived on Merseyside, he generally took up the most advanced of the central midfield positions within the Liverpool line-up. 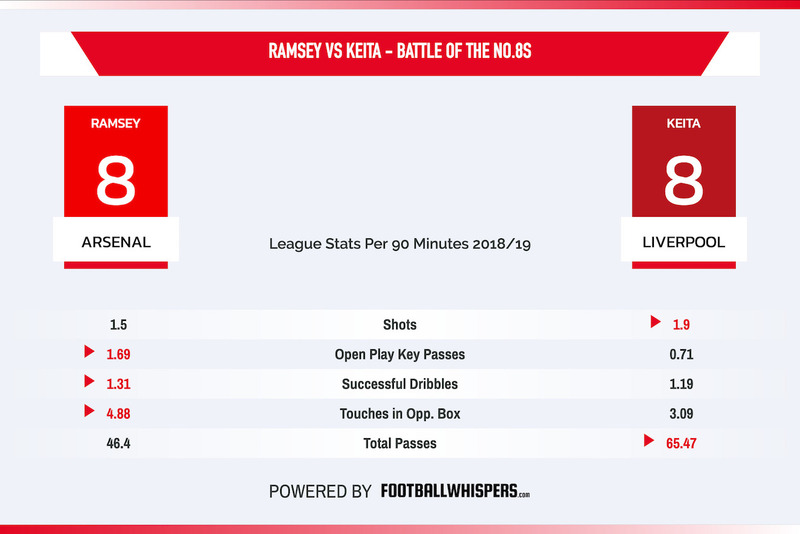 The position has mostly been filled by Naby Keita this season, and their respective Football Whisper persona radars – which illustrate their styles of play – suggest that it would be a bit of a transition for Ramsey. However, the advantage of Ramsey is that he’s immensely flexible in the central midfield area. In the past few seasons alone at Arsenal he has played a variety of different roles. Under Wenger, he was deployed as a standard central midfielder at times and an old-fashioned box-to-box player at others, and under Emery he’s been transformed into something of a number ten. Not only was he showing a very different style of play last season compared to this, but his persona radar was eerily similar to one of Liverpool’s own flexible midfielders, Georginio Wijnaldum. It’s not hard to imagine how Ramsey would fit into the Liverpool team. If he didn’t play in the most advanced of the three central midfield roles, he could play in the slightly less advanced one which James Milner tends to play in when he features in central midfield. The Welshman is of sufficient quality that he could probably even do a decent job as the base of the three. But the question is: do Liverpool need him? Don’t Liverpool have enough midfielders? Jurgen Klopp isn’t exactly short of central midfielders at his disposal – there’s a long list. Milner, Wijnaldum, Keita, Jordan Henderson, Fabinho, Oxlade-Chamberlain, and Adam Lallana. Even though those final two have a history of injury problems, that’s still an embarrassment of riches for just three positions on the pitch. Would Ramsey be a significant enough upgrade to justify the expenditure and the potential for upsetting the group by jettisoning one (or more) of the existing stable? Ramsey is currently performing well in a number of attacking statistics in the Premier League. His 4.88 touches in the opposition box per 90 minutes and 0.27 expected goals assisted per 90 minutes are both more than any Liverpool midfielder is producing. “But I just want to stay fit and healthy this season [2015/16], have a full campaign and get my place back in the middle of the park, because that’s where I feel that I play my best football. Imagine Liverpool being able to switch Keita and Ramsey in that more attacking central midfield role; opponents tired after an hour or more of chasing one of the pair, feeling a sense of relief when they see they are being substituted, only to be downhearted again when they see the other midfielder come on. Ramsey, or Keita, would have to be content to rotate the role though, in all likelihood. Would they be willing to do that? Would Klopp be able to manage them well enough to keep them both happy? It would be awkward and difficult, but the kind of difficult situation that any manager would be glad to have.